The Martin Stiletto Series provides quality Seating at a reasonable price. Equipped with a spacious seat and back with basic ergonomics. Seat is 15x17" waterfall style. This drafting height version adjusts from 24-33" using a pneumatic mechanism. 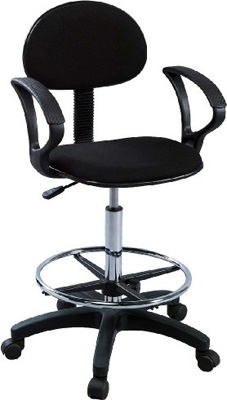 Note the large 23" 5-star safety base and large 18 inch adjustable foot ring. This beautiful foot ring adjusts for maximum comfort. Hooded casters.